Plan to design a funny animation as the Christmas wishes to your best friends or your lover? Then GiftedMotion is probably the right GIF animation tool for you. GiftedMotion is a small, free and easy to use GIF Animator that able to design a funny animation from a series of digital images. GiftedMotion is simple to use and straight forward, the user just need to load the pictures and adjust the frames as you like such as position, time to show and method to dispose previous frames. Support Microsoft Windows, Linux and Mac OS. Able to create animated GIFs from the following images types: PNG, JPG, BMP and GIF. Easy to adjust size of the resulting animation. Easy to adjust position of images within frames. Full control over all aspects of the animated GIF. Able to edit existing GIF animations. Best dithering results, if working with images of more than 256 colors. 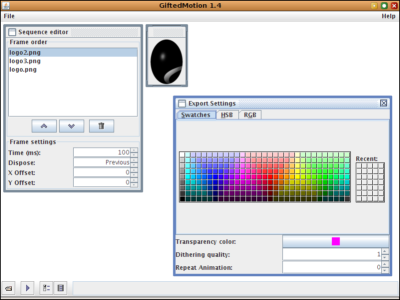 Free to use, no licensing costs, no installation required, just download giftedmotion-1.6.jar file and put on your desktop then start it. It requires Java to run.